"Last week, Paul Comstock, editor and founder of The California Literary Review, asked me to create an illustration for each of their weekly Breaking Bad recaps. Naturally I said yes within seconds. The recaps post the day after the episode airs, so I have to anticipate the plot based on whatever teasers I can find and create an illustration ahead of time. It's an interesting creative challenge, and I'm looking forward to seeing how my ideas match up to the episodes after the fact. 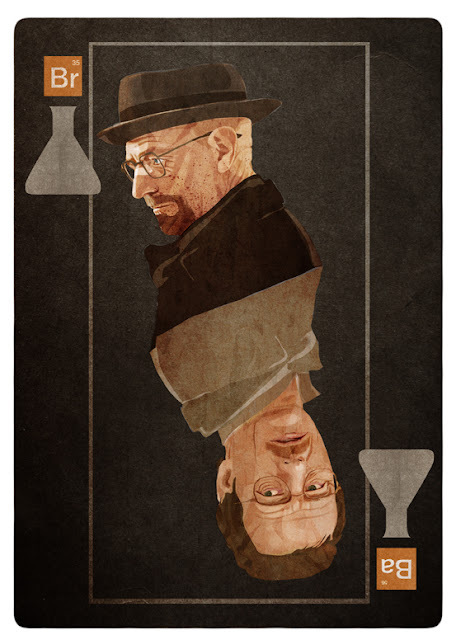 Since the last season ended with Walt as the new meth King, I based my composition on playing card layouts and used the double-view as an opportunity to highlight his transformation from Season 1 to Season 5. Read the recap here and check back next week to see my illustration for Episode 2." Posters: What is Graphic Design?